SOBO Ultra Age Repairing Cream with Resveratrol. Being in my early 20s anti-aging products aren’t at the top of my list, but are in the back of my mind. A good skincare regimen is necessary to keep skin looking healthy. I was able to sample SOBO’s age repairing skin over the past week. You simply apply a small amount to a clean face in the morning and before bed. The cream is light weight and non-greasy. It absorbs quickly and leaves skin feeling firm and refreshed. The cream is unscented so you don’t have to worry about allergies or sensitive skin. The cream is formulated without parabens, sulfates, phthalates, synthetic dyes and fragrances, triclosan, and is not tested on animals. It is reasonably priced and ships for free, so make sure to check it out. See the website description of the product: Treat your skin to the powerful anti-aging benefits of this exceptionally pure multi-peptide complex with organic moisturizers. Light but intense serum formula delivers a powerful wrinkle-fighting cocktail that includes resveratrol, squalene, and hyaluronic acid to reduce the appearance of wrinkles by up to 50% within just 28 days. Soothing, all-natural jojoba oil and apricot kernel oil work together to moisturize and smooth for a healthy, youthful glow and drastically improved overall appearance. And now for a limited time you can save 25% off your entire order by using code TRYSOBO. Disclaimer: I received this product for review, all opinions are 100% my own. When I was contacted by Memebox about reviewing one of there beauty boxes, it was something I couldn’t turn down! I was sent the Memebox Colorbox #1 Red. Memebox is a beauty box from Korea, featuring popular beauty products from that area. They have SO many different types of boxes – so many that I want to try. They have colorbox, scentbox, boxes for the office or travel, you name it they have it! You have probably figured out that since I received the Red Colorbox, that all the items are red in theme. The box included 5 full-sized items plus content card. This specific box retailed for $15. That’s a $47 value, so this box is totally worth the $15. 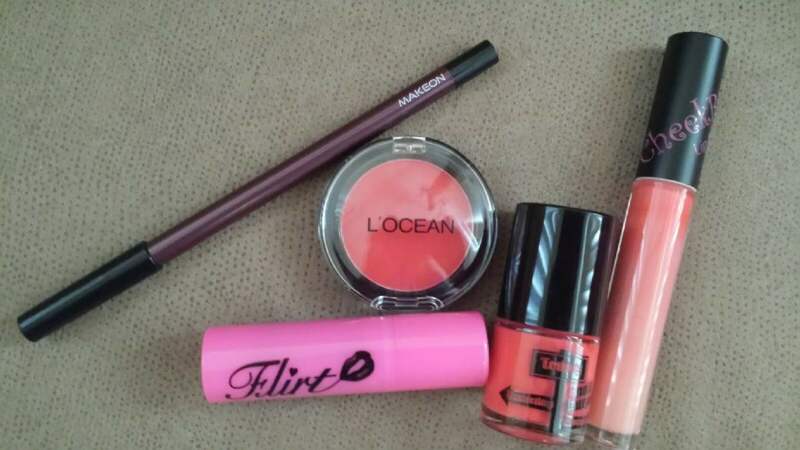 The lip gloss is neat that it’s two colors and you can apply the pink or red to create the look you want. The nail polish is a nice color and has nice coverage and wear-ability. I have not used the eye shadow or lipstick. I just don’t wear red lipstick or shadow. This was a really nice box my only dislike is that it is all red, but I’m not a red person. But I definitely plan to check out other boxes because like I said they offer such a wide variety. I had a lot of fun trying out this box and can’t wait to try more of their boxes in the future. 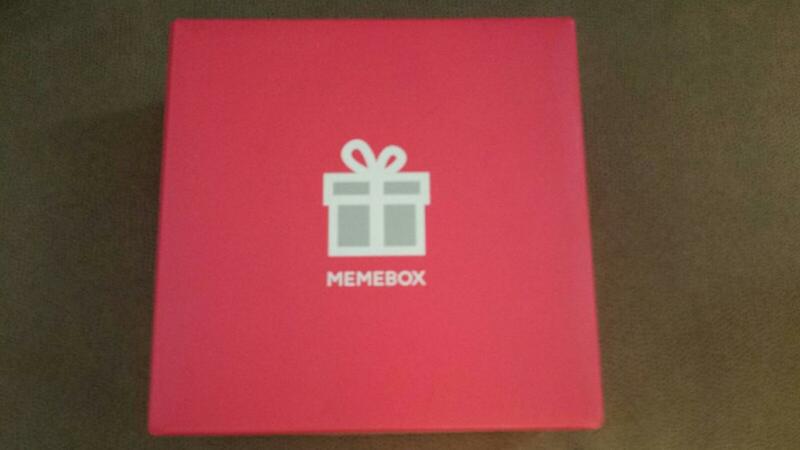 Disclaimer: I received this box from Memebox to review. All opinions are 100% mine. I have subscribed to Birchbox and Ipsy both for a little under a year. In this time I’ve had some really great products and some pretty awful ones. Below is a list I’ve compiled of what I feel are the pros and cons of each of these subscriptions services. Points system. Birchbox by far has the best points system. Review your products each month, they rack up quick. Can use points on anything in the store. Can usually find a promo code for 100 extra points when you subscribe. Many variations of boxes, sometimes I feel like I get leftovers, and they are not equal in value. Often small samples, even foil packets and those cards you rip out of magazines. Sometimes include random non-beauty items: snack bars, vitamins, etc (more often lately). Generally more makeup products in the bag each month. Not as many variations each month so the bags are more equal. Receive a makeup bag each month. Point system isn’t up to par. It would be almost impossible to acquire enough points to redeem without referring people. Can only redeem points on 3-4 items that change slowly. Sometiems the groups of products are not equal in value. For example a $30 Too Faced bronzer or a $6 Revlon lip stain. Repeat brands. They have been better with this but for awhile several bags in a row contained the same brand. What are your thoughts on Birchbox or Ipsy? 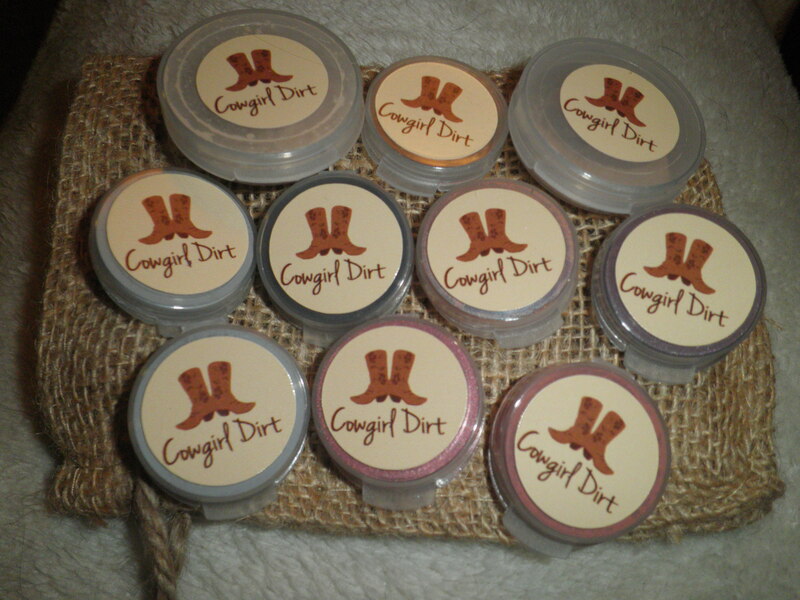 Cowgirl Dirt is a cosmetic company offering a variety of products. “Cowgirl Dirt products are made with the purest natural and organic ingredients. Our collection of mineral-based products not only enhances your natural beauty, but also contains vitamins, nutrients and anti-oxidants that nourish your skin.” Once I saw their brand and how well it fit with my blog I knew I had to work with them! 1. Hi Ho Silver (eye shadow) – Shimmery silver, with a tiny tint of blue. 2. Oklahoma Storm (eye shadow) – Smokey matte black. 3. Cowgirl Up (eye shadow) – Love this color, kind of hard to explain. It’s kind of peachy looking in the image and in the container but when you put it on it’s very shimmery and iridescent (like those hand stamps from Chuck E. Cheese’s if you know what I mean). 4. Raspberry Wine (eye shadow) – Smokey plum with slight shimmer, great for accenting a smokey eye. 5. Rodeo Queen (eye shadow) – Matte blueish-silver (similar to Hi Ho silver, but more blue). 6. Let’s Ride (eye shadow) – Pink shimmer. 7. Rawhide (blush) – Coral-y pink matte. I also received a sample of their Silk Veil powder foundation in Buckskin (a nice light coverage one), finishing powder (creates smooth appearance), and concealer in neutral light (covers very nicely). The eye shadows were really great. 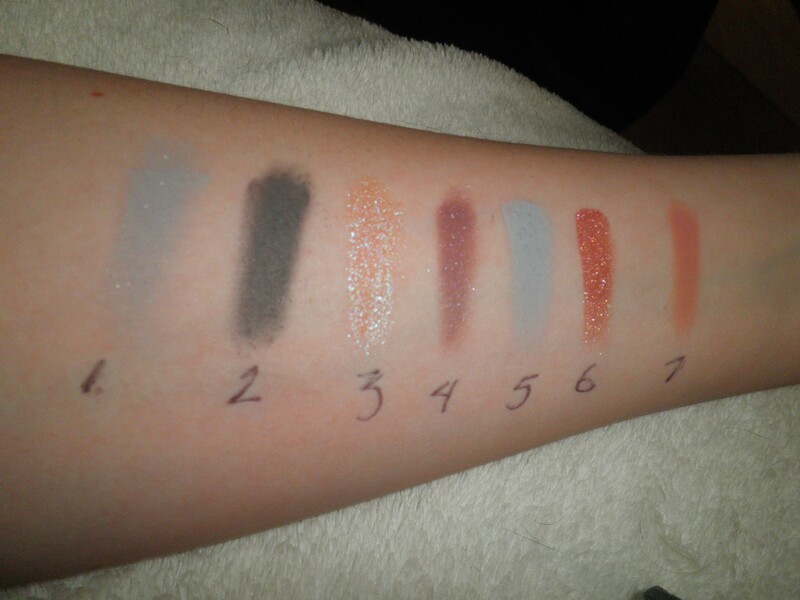 They are all very pigmented and have long wearability. They have a great shade selection as well as finishes (matte, shimmer, etc.). I definitely recommend them to all. It’s also great to see a makeup brand geared towards us farm girls! Because farmers do wear makeup! As you know I have teamed up with Cowgirl Dirt to bring you the first giveaway held on this blog! You can win a lip gloss or eye shadow of your choice! Enter here: giveaway. Disclosure: Financial compensation was not received for this post. A sample product was gifted from Cowgirl Dirt. Opinions expressed here are my own.